Do you know who Micah Tyler is? If your answer is “yes” then you’ll surely be in agreement with me when I say to those who don’t, that they should. 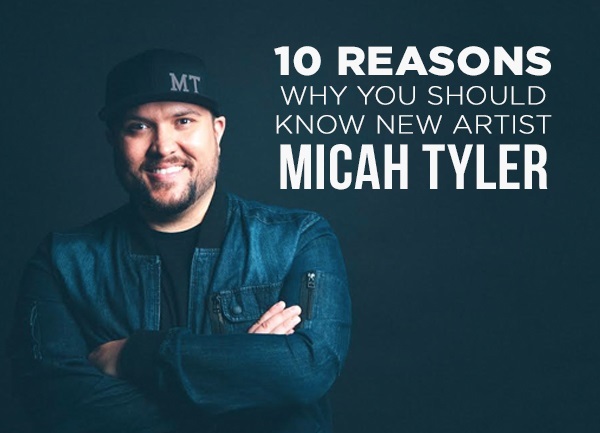 If you aren’t familiar with who Micah Tyler is, allow me to offer 10 reasons that will help you get to know him. Tyler describes his songs as “battle-tested”. “I want to live the music I’m writing. There are some songs I can’t write because I haven’t lived there yet. When someone comes up to me after a concert and tells me how my songs affected them, I want to make sure they know I can relate.” ~Micah Tyler (micahtyler.com) Never been a Moment proves his commitment and dedication to writing solid story-driven lyrics and they pair quite well with his God-given vocals. Micah Tyler created this parody about Millennials which in turn created quite a buzz over the internet. Knowing his background in youth ministry, he surely understands a thing or two about this particular age group. Viewed by millions, this music video went viral raising more than one eyebrow to the talents of Micah Tyler. 4. He has shared the stage with national touring acts such as Building 429, Colton Dixon, Phil Wickham, Shane & Shane, Josh Wilson, and The Afters. This clever promo that Tyler and Wickham put together is a good indicator that Micah Tyler puts on a good show. So it’s understandable that well-known bands and artists would want him to be on stage with them. Be sure to check keep up with Tyler’s touring schedule here as he is slated to be joining MercyMe’s Spring 2017 tour. 5. He has a sense of humor! From the viral video about Millennials to the successive promo videos he has made, it’s apparent that Micah Tyler has a great sense of humor. And hey, Great Lash is a great look for you Mr. Tyler! My workout clothes brught to you by the makers of my mom's mascara growing up. AND So Do His Fans! “If this song was a taco, I’d eat it!” ~MinnesotaDude Yes, please! I’ll go for a taco or two with a healthy side of Micah Tyler’s music. Because his music and tacos are delicious. Included in an all-star musical lineup for God’s Not Dead 2, Micah Tyler’s Directions fits right in. It’s clear that this song comes from Tyler’s personal experience but it relates to all of us who have lost our way and need a little help with directions. Yes, he is. I have a sneaky feeling he’s laughing with the church and not at the church. All too often we Christians are so uptight and forget to relax and laugh a little. We also often forget how to speak “humanese’. Bless our hearts. Tyler has recorded multiple covers, packaged them beautifully and placed them neatly under the #MTCovers Christmas tree for you. These MT cover videos should keep you nicely entertained for a while. Releasing in theaters in early 2017, God Bless the Broken Road will feature music from Micah Tyler along with other great artists such as MercyMe, The Afters and Rascal Flats, whose song, Bless the Broken Road, inspired the movie. 10. He's just like us! Something that I’ve discovered over the years from following and knowing many artists is that they really are human. I say that tongue and cheek but I think sometimes we forget this and put them up on a pedestal. They have lives and families, hopes and dreams, and successes and failures. And they like to have fun with their kids. Just like many of us. Tyler just happens to be gifted with a talent that God allowed him to use as his profession. Do you feel like Micah Tyler is a new old friend? Someone you could invite over for dinner who would sit down at your table and fit right in? It’s clear that he is a funny, fun-loving guy who is committed to Christ and dedicated to his craft. One might say he could be described as Different. Andrea Stunz is a stumbling pilgrim who enjoys life’s adventures with her family and friends, experiencing another sunrise, and writing about them with a good cup of coffee nearby. She shares stories at www.emptyplatefullheart.com.